Clay Cox has been the head coach of the Paris Junior College baseball program since June of 2016. The 2018 season saw another great year of advancement for the Dragons as 15 sophomores signed to play baseball at four-year universities. Twelve of those Dragons signed to play Division I, and the team finished second in all of NJCAA Baseball with a 3.61 team GPA. Under Cox’s tutelage the Dragons finished 2018 eighth in the nation with 135 stolen bases. Sophomore Tyler Mendoza led the conference and finished fifth in the country with 37 stolen bases. 2018 saw more power for the Dragons as well, as they doubled their homerun total from 2017, finishing 35th nationally with 50 homeruns. Cox coached four All-Conference selections and one All-Region selection in 2018. In 2017 the Dragons earned a berth to the Region XIV Tournament for the first time since 2014, advancing to the semi-finals. The Dragons led the conference and ranked in the top 10 nationally with 138 stolen bases. All seven sophomores in 2017 signed to play baseball after PJC with five going to Division I universities. Cox coached three All-Conference selections and one All-Region selection in 2017. In 2015-16 when Cox was assistant coach, the Dragons doubled their win total and improved in every offensive category, including leading the conference in stolen bases. He coached five All-Conference selections and one MLB draft Pick (Chad Hardy who went in the 33rd Round to the Boston Red Sox). 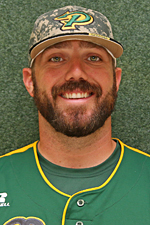 Cox came to PJC from the University of West Alabama where, in 2015, he helped lead the Tigers to a 42-11 (26-6) record, a Gulf South Conference regular season title and GSC tournament championship. The Tigers were ranked seventh in the country and set a school record in winning percentage (.792). UWA had a Division 2 best and school record 20-game win streak. While Cox coached infielders, the Tigers set a school record for fielding percentage (.967) which was ranked tenth nationally. UWA finished in the top three in their conference in (Batting Avg, Runs, Hits, 2B, 3B, HR, RBI, Slug %, BB, SB). UWA was also ranked 25th nationally with 53 HR’s. Cox coached 11 all-conference selections, a GSC Player of the Year, five all-region selections, three All-Americans, and two MLB draft picks while at UWA. In the summer of 2016, Cox coached his third and final season with the Brazos Valley Bombers of the Texas Collegiate League. They ended their season ranked third in the country for the second straight year. The Bombers finished with a 48-7 record and an unprecedented fourth straight Texas Collegiate League title. 2016 was a summer of records for the Bombers, breaking the TCL record for stolen bases (159), winning streak (21), regular season wins (47), and half-season record (28-2). During the two preceding years he helped the Bombers to back-to-back-to-back TCL titles, finishing 2015 with a record of 45-9 wins in the regular season, TCL title and finishing ranked third in the nation. The Bombers finished 2014 with a 45-15 record, a TCL title and a national ranking of fifth. Cox was selected to the Texas Collegiate League North All-Star coaching staff in both the 2014 and 2015 seasons. He helped the Bombers lead the league in ERA, Batting Average and fielding percentage in all three seasons. Cox has coached 16 Major League draft picks with Brazos Valley. Cox also served as head coach of the 2016 TCL Red All-Star Team. Prior to UWA, Cox coached at Rockdale High School, where he was the head varsity baseball coach for two seasons. During that time Rockdale won more games than in any other two year span in school history. Under Cox, Rockdale set school records for win streak (11), stolen bases in a single game (20), and stolen bases in a season (135). He coached two all-star selections, four all-state choices, seven academic all-district selections and three academic all-state honorees. Before Rockdale, Cox was the head baseball coach at Jacksboro High School. He also had a coaching stop at James Bowie High School in Simms. His career totals as a prep head coach include 16 all-district selections, nine all-state choices and five all-star selections. He twice produced the 3A Baseball “Hitter of the Week” by TxHighSchoolBaseball.com. His collegiate totals include 23 all-conference selections, eight all-region selections, three All-Americans, 31 MLB Draft picks and three major leaguers. Cox has coached a total of 41 players who have signed to play professional baseball following college. Cox earned his Bachelor of Science in Kinesiology from Texas A&M in 2008 with a minor in coaching. He holds two masters degrees: a 2014 Master of Arts in Coaching and Athletic Administration from Concordia University – Irvine and a 2015 Master of Arts in Teaching – Physical Education from the University of West Alabama. 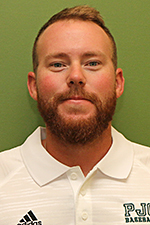 Brandon Pennington is starting his first year as assistant baseball coach at Paris Junior College, where he serves as the Dragons pitching coach and recruiting coordinator. In 2017-2018, Pennington served as an assistant coach at Meridian Community College in Meridian, Miss. He helped the Eagles to a 39-13 (21-7) record on the year. They came up just short of a World Series berth, losing to eventual national champion LSU Eunice in the Regional Championship. Four of the five Eagle sophomore pitchers signed division one scholarships. They also had three draft picks (11th round to the Miami Marlins, 16th round to the Los Angeles Dodgers, and the 22nd round to the Miami Marlins). Prior to Meridian, Pennington served as a graduate assistant at his alma mater, the University of West Alabama. In 2017 the Tigers finished as the Gulf South runner-up. UWA saw their amazing post-season run come one game short of the NCAA Division II World Series, with a loss to conference rival Delta State. During his time as graduate assistant at West Alabama, Pennington helped with day-to-day duties, assisted in running the pitching staff, and recruiting. In the summer of 2017, Pennington coached with the Battle Creek Bombers of the prestigious North Woods League. The Bombers pitching staff finished the summer with a 4.19 ERA and a record of 42-30. That record was good enough to capture a South Division Crown while posting a 2.00 ERA in the playoffs and playing for a North Woods League Championship. Pennington was a 2011 graduate of Sumrall High School in Sumrall, Miss. During his senior season, Sumrall posted a 30-5 record and went on to win the 3A Mississippi State Championship. As a senior, Pennington was 11-1 with a 1.02 ERA. The senior class of Sumrall ended their career going 133-12. Following a stellar senior campaign with Sumrall, Pennington signed with Pearl River Community College where he played for two years. In 2013 Pearl River set the MACJC record for conference wins in a season with 20, hosted the conference and regional tournament, and finished just one game shy of the NJCAA Division II World Series. In 2014 he signed with the University of West Alabama. The spring of 2015 was a landmark year for the Tigers as they went 42-11, winning the Gulf South Conference Championship and GSC Tournament. That season saw UWA set a school record for winning percentage (.792) and win streak (20). The Tigers hosted the South Regional tournament, losing to eventual national champion, the University of Tampa. Pennington finished that season with a 6-1 record on the mound, finishing fourth in the nation with a 2.84 ERA. That summer Pennington pitched for the Brazos Valley Bombers of the Texas Collegiate League. He helped the Bombers to a 45-9 record and finished second in the TCL in saves, serving as the Bombers closer.